Today I’m going to introduce you to a new acronym. Just this last one, then we’re through. Done. Kaput. I promise. There, that wasn’t so bad. Right? Here, it’s the word “just” – not “tool” – that triggers my outrage. BIM is not “just” anything. This blog’s brand is more horse feathers than high horse, more horse sense than nonsense – so accept what I’m about to say as an exception to the rule. My anger – and incredulousness (yes, it’s a word) – in online discussions and interviews. 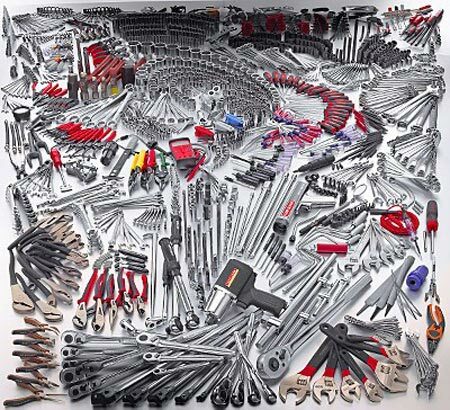 That BIM is “just a tool” – like it’s just a can opener or a pair of pliers or a hammer. At least until BIM becomes a staple in the industry. They swat away the insinuation that what they are using or doing is anything more than a revved-up 2H pencil with an off-handed dismissive sweep of the hand like they were swatting flies. The way that the iPhone is just a tool. Or the GPS is just a tool. Only that BIM is ALL of these in one. And the add-ons are BIM’s apps. App-like tools available for every part of the BIM process. BIM is not a tool, authoring, analyzing or otherwise. Apps are tools, I’ll concede you that. And also likely, relevant, necessary and inevitable. BIM is more than what’s happening on your desktop. BIM is just a process. BIM is just a strategy. BIM is not just a technology: software is. Just as peanut butter can exist without jelly. WHY ON EARTH WOULD ANYONE WANT TO DO THAT?! Get on your high horses, people – the Age of Aquarius for design professionals is upon us. *Except for the last two letters. Shucks. BIM? It’s just a computable representation of the physical and functional characteristics of a facility. BIM is just information use, reuse, and exchange just with integrated 3D-2D model-based technology. No big deal. BIM is just a single repository including both graphical and non-graphical documents – that’s all. BIM is just a building design and documentation methodology characterized by the creation and use of coordinated, internally consistent computable information about a building project in design and construction. Nothing more, really. There’s no need for the acronym JAT. BIM isn’t “just” any thing. What are you doing on August 2, 2010? That’s the day* Mastering Autodesk Revit Architecture 2011 – or MARA2011 for short – written by the authorial triumvirate of Eddy Krygiel, Phil Read and the inestimable James Vandezande comes out. I may not know where I’ll be on August 2nd – but I can tell you this. On August 1st I’ll be waiting in line at the Winnetka Book Coop awaiting the 12 midnight book release. Winnetka – with its trophy kids and designer dogs – hasn’t seen anything like this since the last Harry Potter book launch. There’s been not a little online and offline buzz about the meaning and significance of the launch date. August 2, 2010 is a Monday. Except in leap years, no other month starts on the same day of the week as August. That’s significant. Also, the book is being released while the Sturgis Motorcycle Rally is being held. That’s too bad for the bikers but gives everyone else an edge. But if the book hasn’t been released yet – how can I reliably review the book without having read it? The same way that the book’s authors are giving book signings without the book. For more on this see Book signing – without the book! It is apparently possible to not only sign books that haven’t been published but also to talk about books you haven’t read – a practice encouraged in places of higher learning and France. What are we supposed to do in these awkward months before books are released in which we’re inclined to talk about a book we haven’t read? How to talk about How to Talk About Books You Haven’t Read if you haven’t in fact read it? You want to know how I am able to share with you the contents of Mastering Autodesk Revit Architecture 2011 before its publication date? It’s one helluva story. Here goes. You may or may not recall that an entire truckload of copies of the new Mastering Autodesk Revit Architecture 2011 book, both weighing and costing an estimated one million pounds, had been stolen just months before the eagerly awaited BIM book was due to appear in bookstores. The good news is that all of the yet-to-be-sold books have been recovered unscathed – with the sole exception of one copy that had not been accounted for until it became apparent that the “invaluable” (attorneys) prototype was left in a Silicon Valley bar by a disgruntled, as yet unidentified 2D CAD manager and later purchased for an undisclosed sum ($37.78) by Bimodo.com who proceeded to take the book apart page by page to study its substantial innards, dissecting it and posting embarrassing pictures and revealing video detailing its impressive features. I’d link to the videos but I have to consider this blog’s family-oriented audience. The authors, who closely guard details about their unreleased books, were too busy disclosing the most minute details of their top-secret book in their blogs to be reached for comment. – and was able to observe the following information about the book while he proceeded to make the dastardly, ill-advised call to Bimodo.com on a wall-hung pay phone. For those who would like to appear knowledgeable about Mastering Autodesk Revit Architecture 2011 prior to its well-anticipated release, read on. Due to state laws forbidding the transfer of smuggled books over state lines I can only share with you a small sampling of what’s in store. The book is written in English, unless you are unfamiliar with Revit. REASON 1: Reading the book now, before it comes out, will give you a competitive advantage over your competition. When your competition returns in September they won’t know what hit them. REASON 2: Aug 2 is a good book launch date. Your competition is on the beach relaxing, sipping margaritas while you’re sailing by on your inflatable-of-choice reading away. So clear your calendar. Leave August – the hottest month of the year – wide open. You may want to keep in mind that August is the month therapists are on vacation. I’m only saying. REASON 3: The authors – likened elsewhere to Ruth, DiMaggio and Mantle (Yankees) and Luciano Pavarotti, Plácido Domingo and José Carreras (Mets) – held nothing back and pulled no punches – in the scribing of their tome. On August 2nd, you will hold in your hands everything these guys know. Period. Having given their all, the authors themselves have been reduced to empty shells, mere husks of their former selves. You’re now the keepers of their content – they’re barely haircuts in suits. Enjoy. REASON 4: For the same reason you work in BIM and Integrated Design – without everything all perfectly worked out. For the same reason you work in BIM without the assurances of complete interoperability. You find coping mechanisms and plug-ins. Patience, faith, hope and confidence that everything will be worked out in time. Besides, design professionals for a living envision what is not there. It is one of our core attributes and competencies. We don’t need a book to read it any more than we need a building to design it. Don’t let the pesky detail that the book does not yet exist stand in your way of reading it. REASON 5: Get a jump start, before the book comes out, and form a study group. In advance – upon return from summer vacation each employee prepares to present a different topic at a lunchtime lunch and learn. Each employee picks a chapter and runs with it. Does the double duty of providing much-needed presentation experience for emerging employees. Until the release date – you can do some prep work – some of the heavy lifting – prepare a work plan, a study plan, look online here at the table of contents to decide where you will focus first. Or read on. Here are all the reasons you need to read this outstanding as yet-to-be-published book – the best book I haven’t read in ages. Part I: Fundamentals provides discussions of key BIM and Revit concepts before giving readers a hands-on look at the Revit interface. 2 The Principles of Revit: Tools and UI. 3 The Basics of the Revit Toolbox. Part II: The Revit Workflow, explores today’s Revit workflows and introduces readers to templates, worksharing, and managing Revit projects. 4 Configuring Templates and Standards. 5 Managing a Revit Project. Part III: Modeling and Massing for Design dives into modeling and massing and offers detailed information on the crucial Family Editor as well as visualization techniques for various industries. 9 Advanced Modeling and Massing. 10 Conceptual Design and Sustainability. 11 Phasing, Groups, and Design Options. Part IV: Extended Modeling Techniques covers documentation, including annotation and detailing, and explains how to work with complex walls, roofs and floors as well as curtain walls and advanced stair and railings. 13 Walls and Curtain Walls. 22 Revit in the Classroom. 26 Revit for Film and Stage. 27 Revit in the Cloud. There you have it. 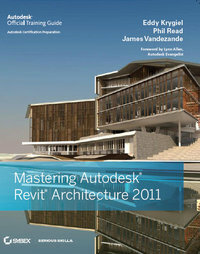 27 great reasons to read Mastering Autodesk Revit Architecture 2011 now, before it comes out. 28 Mastering Autodesk Revit Architecture 2011’s focused discussions, detailed exercises, and compelling real-world examples are organized by how users learn and implement Revit, an approach that will resonate with Revit users of all skill levels. 29 The expert authors developed this practical reference and tutorial based on years of experience using the program and training others to do so. 30 Unlike the competition, Mastering Revit Architecture is organized by real-world workflows and features detailed explanations, interesting real-world examples, and practical tutorials to help readers understand Revit and BIM concepts so that they can quickly start accomplishing vital Revit tasks. For the same reason that many professionals should avoid waiting until things are perfect and all worked-out with their technology before jumping-in, there is no better time than now – before the book is published and distributed – to read this insightful guide. The release date will come sooner than you think – the future is nearer than you think – so act now. Click here and free yourself. In the meantime, come August 2 – you will have the immaculate door-stopper and show stopper. Don’t wait. BIM operators are standing by. * Important Update: Now you really can read Mastering Autodesk Revit Architecture 2011 before it comes out! I just learned from a very reliable source (the publisher) that this post identified the official announced publication date (when they pop the champagne) as August 2 – which remains accurate – but in fact failed to mention that you can get Mastering Autodesk Revit Architecture 2011 from the Wiley website as early as July 12, and from Amazon very shortly thereafter and at most stores where books are sold by July 26. See comment below for more on this. Do not drink and read. ** The final official tally is 1080 pages – the equivalent of each author having written a 360 page book! Craft is the pride one takes in making – making things – with one’s hands, mind and imagination. Two books that address craft – one recent and one published 50 years ago – help make clear the predicament architects find themselves in today as they face an uncertain future. In The­_Craftsman, author and sociologist Prof. Richard Sennett asks what the process of making concrete things reveals to us about ourselves – what people can learn about themselves from the things they make. Craftsmanship here is defined as an enduring, basic human impulse, the skill of making things well. The pride one takes in work – whether making a wood model or a computer model – requires focusing on the intimate connection between head and hand, establishing effective, sustainable habits and a rhythm between problem finding and problem solving. It is an internal dialogue every craftsman – and architect – conducts in practice. Craftsmanship, by combining skill, commitment and judgment, establishes a close relationship between head and hand, man and machine that Sennett asserts is vital to physical, mental and societal well-being. Combining a “material consciousness” with a willingness to put in years of practice (a common estimate of the time required to master a craft is 10,000 hours) and an acceptance of ambiguity, rather than an obsessive perfectionism, should be familiar to readers of Malcolm Gladwell’s Outliers, Dean Simonton’s Greatness and readers of this blog. Sennett asks whether our commitment to work – our craftsmanship – is merely about money, or about something deeper and more human. His answer implies that commitment – the skill, care, late nights, problem solving and pride that goes into our work – is about something greater. Sennett does not think that craftsmanship has vanished from our world. On the contrary, as another critic noted, it has merely migrated to other regions of human enterprise, “so that the delicate form of skilled cooperation that once produced a cathedral now produces the Linux software system” – or, in the case of architects who take part in integrated practice, their work in BIM. The subject of craft has been all but excluded to date from discussions about building information modeling (BIM) and this poses a liability and potential hazard for architects – for therein resides our dedication, passion and resolve. Hannah Arendt’s book, The_Human_Condition, published 50 years ago, distinguishes between labor, work, and action, explores the implications of these distinctions and affirms the value of human beings speaking openly and candidly to each other. In the book Arendt (1906-1975) famously distinguishes between Animal laborans and Homo faber, between labor and work. Labor is, according to Arendt, those human activities whose main aim is to allow men to survive, belong to the private sphere, and while the human being strives painstakingly to perform them, is not free. As Sennett – Arendt’s student in the 60’s – points out Animal laborans is akin to the beast of burden, “a drudge condemned to routine.” Here the derogatory term “CAD-jockey” comes to mind, one who envisions spending their working lives in front of a monitor churning out construction documents. Animal laborans: they’re the ones who, working alone, take the work as an end in itself. With Homo faber, on the other hand, one imagines men and women doing work together and in doing so making a life in common. This is the public sphere, where men, after having provided for themselves and their families what was needed to continue, can at last be free. The name according to Sennett implies a higher way of life, one in which we stop producing and start discussing and judging together. It is in this word – together – that we find the seeds for collaboration and for integrated practice. where BIM enables integrated practice. The combination of speech and action the book calls for is the perfect prescription for integrated practice or IPD: architects working together with others, collaborating toward a common goal. Sennett sees it differently and challenges his teacher’s definition of Labor as being too limited, slighting the practical man and woman at work, and offers a more balanced view – where thinking and feeling are contained within the process of making. Such is the student’s prerogative. Some architects complain that BIM – in being so fact-based and answer-hungry – makes them less creative, describing their work as “feeding the beast.” Here again we find Arendt’s Animal laborans, for whom the mind engages once the labor is done, and Sennett is right to push further. When Sennett writes “leaving the public to ‘sort out the problem’ after the work is done means confronting people with usually irreversible facts,” and “engagement must start earlier, requires a fuller, better understanding of the process by which people go about producing things,” he could have been describing BIM, and IPD, the process it enables. IPD fulfills the promise and dictates of BIM just as Homo faber provides something for Animal laborans to aspire to. One of Arendt’s great themes is her sense of the decline of the public realm, the realm where action takes place. With the growing use of BIM, and through it integrated practice, architects once again have an opportunity to find themselves working in – and positively influencing if not creating – the public realm.